Only one other person knows about my raging obsession with the musical Hamilton, and the sad part is, it’s not actually a person. It’s YouTube. Like a friend who knows me too well, YouTube decided months ago to begin pre-emptively front-loading its home page for me with clips dedicated to Lin-Manuel Miranda’s earth-rattling masterstroke of a Founding Father hip-hopera. It knew how hooked I was on Alexander Hamilton’s onstage biography and its fervid, florid songs of kinship and rebellion before I’d fully acknowledged it myself. And like a sad sack who pines for the object of her affection from afar, I kept watching despite how silly it made me feel. A crush on a musical (or a movie or a novel or an album or a TV show) is awkward to explain. It’s not the same as having the hots for the movie’s leading man, the album’s lead singer or the musical’s marquee star. It’s not a daydream about an individual you want to be with; it’s more about a world you dream of inhabiting. Exactly how you’d inhabit such a world is a fuzzy notion — I’m not saying I want to act in Hamilton, for starters — and it’s one I can only think to describe by referencing past fixations. Like, do you remember in High Fidelity, when John Cusack muses about how cool it’d be if Lisa Bonet would cut a record and just “include one of our private little jokes in the liner notes?” Or did you ever see on My So-Called Life when Rayanne’s mom told Angela’s mom that Rayanne wants to live in Angela’s bed “and just be her?” It’s kind of like that. What makes all this so embarrassing the second time around is that, like Rent, Hamilton is about longing, aspiration. The impoverished creative types of Rent’s East Village and the revolutionaries of Hamilton’s nascent America are yearning for ideals yet fulfilled, be they the desire to make art or to forge imperfect unions. The pre-millennial, “no day but today” refrain of Rent finds its siren call answered by Hamilton’s pre-Republic “not throwing away my shot.” When I was 25, newly transplanted to New York and desperate to pen my future narrative, my life was about that striving, too. But now, with a terrific spouse and a to-die-for daughter and a (mmm, successful-enough) career, it’s chastening to admit how much the allure of restless youth remains. Except that’s the whole point of entertainment: to take you out of your real, even happy, life and into an imagined and fantasized (perhaps even recaptured) one. 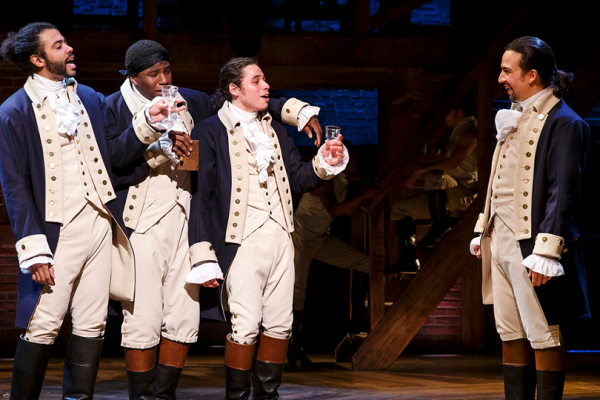 In Hamilton, the title character insists, “I’m just like my country; I’m young, scrappy and hungry.” I’m not young and scrappy anymore, but like Hamilton, I’m still hungry. And I’m not throwing away my shot at feeling that way again.